"Death note" redirects here. For other uses, see Death Note (disambiguation). Death Note was first serialized in Shueisha's manga magazine Weekly Shōnen Jump from December 2003 to May 2006. The 108 chapters were collected and published into 12 tankōbon volumes between April 2004 and July 2006. An anime television adaptation aired in Japan from October 3, 2006, to June 26, 2007. Composed of 37 episodes, the anime was developed by Madhouse and directed by Tetsurō Araki. A light novel based on the series, written by Nisio Isin, was also released in 2006. Additionally, various video games have been published by Konami for the Nintendo DS. The series was adapted into three live action films released in Japan on June 17, 2006, November 3, 2006, and February 2, 2008, and a television drama in 2015. A miniseries entitled Death Note: New Generation and a fourth film were released in 2016. An American film adaptation was released on Netflix on August 24, 2017. Death Note media is licensed and released in North America by Viz Media, with the exception of the video games and soundtracks. The episodes from the anime first appeared in North America as downloadable from IGN, before Viz Media licensed it and it aired on YTV's Bionix anime block in Canada and on Adult Swim in the United States with a DVD release following. The live-action films briefly played in certain North American theaters in 2008, before receiving home video releases. In 2015, the collected volumes of the Death Note manga had over 30 million copies in circulation. In Tokyo, an intelligent yet disaffected high-school student named Light Yagami finds the "Death Note", a mysterious black notebook which can kill anyone as long as the user knows both the target's name and face. After verifying that the notebook works and initially being terrified of its god-like abilities, Light begins to consider the possibilities of the Death Note's abilities and sets out to create a utopian world without crime, killing numerous high-profile Japanese criminals, before eventually targeting international law-offenders around the world. Eventually, Light is visited by Ryuk, a Japanese god of death and the Death Note's previous owner, who dropped the notebook into the human world out of boredom. Ryuk, who is invisible to anyone who has not touched the Death Note, is amused by Light's actions and serves as Light's companion. As numerous criminals and convicts around the world begin to die of inexplicable freak accidents and heart attacks, the global media begin to believe that an individual is responsible for the mysterious murders and start designating him as "Kira", a Japanese transliteration of the word "killer", who is both feared and beloved by the public and the law enforcement agencies. Hoping to apprehend Kira, Interpol requests the assistance of an enigmatic and highly-esteemed international consulting detective, known as L, who has cracked numerous crime cases around the world, to assist them in the investigation. After deducing that Kira is based in Japan, L stages a TV broadcast in which he tricks Light into revealing that he is in the Kanto region of Japan, by manipulating him to kill a decoy. Humiliated, Light vows to kill L, whom he views as obstructing his plans. L quickly deduces that Kira has inside knowledge of the Japanese police's investigation, led by Light's father, Soichiro Yagami. Under the suspicion that "Kira" could have familial connections with the members of the "Kira" investigation, L assigns a team of FBI agents to monitor the families of those connected with the investigation, but Light outmaneuvers and kills them all. Nonetheless, L picks up enough hints to designate Light as the prime suspect. Around this time, Light graduates from high school to college. L recruits Light into the Kira Task Force, both trying to get the other to reveal crucial info. At this point, a famous model/actress named Misa Amane gains a second Death Note from a Shinigami named Rem. Misa makes a deal with Rem for Shinigami eyes, which allows her to kill knowing only the face at the cost of half her lifespan. Misa commits numerous murders, sends taped recordings to the police, and eventually uncovers Light's identity as the original Kira. Infatuated with Light, she demands Light be her boyfriend. Although he does not love Misa, Light agrees, intending to use Misa's Shinigami eyes to discern L's true name. However, before she can do so, L deduces that Misa is likely the second Kira and detains her. Rem, who has feelings for Misa, threatens to kill Light if he does not find a way to save Misa. Light arranges a scheme in which he and Misa temporarily lose their memories of the Death Note, and has Rem pass the Death Note to a less morally-driven individual, Kyosuke Higuchi of the Yotsuba Group. Now with no knowledge of the Death Note, Light wholeheartedly joins the investigation. Together, Light and L deduce Higuchi's identity, arrest him, and discover the existence of the Death Notes and the Shinigami. When they touch the Death Note, Light and Misa regain their memories, and Light kills Higuchi with a piece of the Death Note, regaining possession of the book. However, L casts suspicion on Misa, forcing Rem to murder L to save her. Rem dies in the process, as it is forbidden for Shinigami to protect human individuals. The task force agrees to cover up L's death and appoint Light as the new L. The investigation stalls as a result. Four years later, crime rates worldwide have massively dropped, but cults have arisen which adore Kira. Two intelligent young men, who were raised as potential successors to L, are revealed: Near and Mello. Both are aware that L is dead, and thus consider Light, the current L, a prime suspect. Mello, along with the Mafia's assistance, kidnaps Light's sister, resulting in his father's death during the rescue mission. As suspicion starts to fall again on Misa, Light passes Misa's Death Note to a fervent supporter of Kira, Teru Mikami. He also appoints a well-known newscaster, Kiyomi Takada as Kira's public spokesperson. Realizing that Takada is connected to Kira, Mello kidnaps her. Takada kills Mello with a hidden page of the Death Note, but is killed by Light, in order to dispel suspicions. Shortly after, Near deduces Mikami's connection to Kira and arranges a meeting between Light and the current Kira Task Force members. Light seizes the chance to have Mikami kill Near as well as all the task force members. However, Mikami's Death Note fails to work. It is revealed that Near had replaced Mikami's Death Note with a decoy. Perusing the names Mikami had written down, only Light's is missing, which proves Light as Kira. A scuffle breaks out during which Light is grievously wounded. Ryuk, realizing that Light will spend the rest of his life in prison, writes down Light's name in his Death Note as he had promised to do at the beginning of the story. The Death Note concept derived from a rather general concept involving Shinigami and "specific rules". Ohba wanted to create a suspense series because he did not feel that he could have created a fight-style series and that the genre had few suspense series' available to the public. After publication of the pilot chapter, the series was not expected to be approved as a serialized comic by the author, who did not consider it to "fit with Jump". Ohba said that, when he learned that Death Note had received approval and that Takeshi Obata would create the artwork, he "couldn't even believe it". Due to positive reactions, Death Note became a serialized manga series. "Thumbnails" were created incorporating dialog, panel layout, and basic drawings, and were sent to the illustrator. The editor reviewed the thumbnails and sent them to the illustrator (Obata) with the script set in stone and the panel layout "mostly done". Obata then determined the expressions and "camera angles" and created the final artwork. Ohba concentrated on the tempo and the amount of dialogue, making sure that the text was as concise as possible. Ohba commented that he believed "reading too much exposition" would be tiring and would negatively affect the atmosphere and "air of suspense". Significant artistic license was given to the illustrator who worked on basic descriptions, such as "abandoned building", and this extended to the design of the Death Notes with Obata given a free rein. When Ohba decided on the plot he internally visualized the panels while on his bed, drinking tea, or walking around his house, needing to feel relaxed while visualizing the panels. On many occasions, the original draft was too long and needed to be refined various times before the desired "tempo" and "flow" for the chapter was finalized. The writer remarked on his preference for reading the previous "two or four" chapters carefully to ensure consistency in the story. The typical weekly production schedule consisted of five days of creating and thinking and one-day using a pencil to insert dialogue into rough drafts; after this point, the writer faxed any initial drafts to the editor. The illustrator's weekly production schedule involved one day with the thumbnails, layout, and pencils and one day with additional penciling and inking. Obata's assistants usually worked for four days and Obata spent one day to finish it. Obata said that sometimes he took a few extra days to color pages and that this "messed with the schedule". In contrast, the writer took three or four days to create a chapter on some occasions, while on others he took a month. Obata said that his schedule remained consistent except when he had to create color pages. Ohba and Obata rarely met in person during the creation of the serialized manga; instead, the two met with the editor. The first time they met in person was at an editorial party in January 2004. Obata said that, despite the intrigue, he did not ask his editor about Ohba's plot developments as he anticipated the new thumbnails every week. The two did not discuss the final chapters with one another and they continued to talk with the editor. Ohba said that when he asked the editor if Obata had "said anything" about the story and plot the editor responded: "No, nothing". Ohba claims that the series ended more or less in the manner that he intended for it to end; he considered the idea of L defeating Light Yagami with Light dying, but instead chose to use the "Yellow Box Warehouse" ending. According to Ohba, the details had been set "from the beginning". The writer wanted an ongoing plot line instead of an episodic series because Death Note was serialized and its focus was intended to be on a cast with a series of events triggered by the Death Note. 13: How to Read states that the humorous aspects of Death Note originated from Ohba's "enjoyment of humorous stories". When Ohba was asked, during an interview, whether the series was meant to be about enjoying the plot twists and psychological warfare, Ohba responded by saying that this concept was the reason why he was "very happy" to place the story in Weekly Shōnen Jump. The core plot device of the story is the "Death Note" itself, a black notebook with instructions (known as "Rules of the Death Note") written on the inside. When used correctly, it allows anyone to commit a murder, knowing only the victim's name and face. According to the director of the live-action films, Shusuke Kaneko, "[t]he idea of spirits living in words is an ancient Japanese concept... In a way, it's a very Japanese story". Artist Takeshi Obata originally thought of the books as "Something you would automatically think was a Death Note". Deciding that this design would be cumbersome, he instead opted for a more accessible college notebook. Death Notes were originally conceived as changing based on time and location, resembling scrolls in ancient Japan, or the Old Testament in medieval Europe. However, this idea was never used. Writer Tsugumi Ohba had no particular themes in mind for Death Note. When pushed, he suggested: "Humans will all eventually die and never come back to life, so let's give it our all while we're alive". He went on to say that "no human has the right to pass judgment on another's actions. No one should play God". He said that Near's climactic speech about good and evil was rooted in his own beliefs. In a 2012 paper, Jolyon Baraka Thomas characterised Death Note as heavily influenced by the conflicts between liberty and security; as illustrating that high moral ideals are easily corrupted, and that people will always justify horrific acts of violence in the name of safety. Thomas writes that "the price of peace is death". Thomas' paper lists Death Note as one of the later and more sophisticated psychological thrillers released in the wake of the 1995 Tokyo subway sarin attack, saying that it examines the human tendency to express itself through "horrific" cults and describes the negative effects of those cults on the members, on their families, and on society. Through the moral relativity that characterizes the story throughout, readers are reminded that their own ideas of good and evil might not differ so much from those of extremist cult members. Obata said that he wanted to draw the story after he heard of a "horror story featuring Shinigami". According to Obata, when he first received the rough draft created by Ohba, he "didn't really get it" at first and he wanted to work on the project due to the presence of Shinigami and because the work "was dark". He also said he wondered about the progression of the plot as he read the thumbnails, and if Jump readers would enjoy reading the comic. Obata said that while there is little action and the main character "doesn't really drive the plot", he enjoyed the atmosphere of the story. He stated that he drew the pilot chapter so that it would appeal to himself. Ohba brought the rough draft of the pilot chapter to the editorial department. Obata came into the picture at a later point to create the artwork. They did not meet in person while creating the pilot chapter. Ohba said that the editor told him he did not need to meet with Obata to discuss the pilot; Ohba said "I think it worked out all right". Tetsurō Araki, the director, said that he wished to convey aspects that "made the series interesting" instead of simply "focusing on morals or the concept of justice". Toshiki Inoue, the series organizer, agreed with Araki and added that, in anime adaptations, there is a lot of importance in highlighting the aspects that are "interesting in the original". He concluded that Light's presence was "the most compelling" aspect; therefore the adaptation chronicles Light's "thoughts and actions as much as possible". Inoue noted that to best incorporate the manga's plot into the anime, he "tweak[ed] the chronology a bit" and incorporated flashbacks that appear after the openings of the episodes; he said this revealed the desired tensions. Araki said that, because in an anime the viewer cannot "turn back pages" in the manner that a manga reader can, the anime staff ensured that the show clarified details. Inoue added that the staff did not want to get involved with every single detail, so the staff selected elements to emphasize. Due to the complexity of the original manga, he described the process as "definitely delicate and a great challenge". Inoue admitted that he placed more instructions and notes in the script than usual. Araki added that because of the importance of otherwise trivial details, this commentary became crucial to the development of the series. Araki said that when he discovered the Death Note anime project, he "literally begged" to join the production team; when he joined he insisted that Inoue should write the scripts. Inoue added that, because he enjoyed reading the manga, he wished to use his effort. The Death Note manga series was first serialized in the Japanese manga magazine Weekly Shōnen Jump published by Shueisha on December 1, 2003. The series has since ended in Japan with a total of 108 chapters. Later, the individual chapters were collected into twelve separate tankōbon. In April 2005, Death Note was licensed for publication in North America by Viz Media, and the first English language volume was released on October 10, 2005. In February 2008, a one-shot special was released. Set two years after the manga's epilogue, it sees the introduction of a new Kira and the reactions of the main characters in response to the copycat's appearance. Several Death Note yonkoma (four-panel comics) appeared in Akamaru Jump. The yonkoma were written to be humorous. The Akamaru Jump issues that printed the comics include 2004 Spring, 2004 Summer, 2005 Winter, and 2005 Spring. In addition Weekly Shōnen Jump Gag Special 2005 included some Death Note yonkoma in a Jump Heroes Super 4-Panel Competition. In addition, a guidebook for the manga was also released on October 13, 2006. It was named Death Note 13: How to Read and contained data relating to the series, including character profiles of almost every character that is named, creator interviews, behind the scenes info for the series and the pilot chapter that preceded Death Note. It also reprinted all of the yonkoma serialized in Akamaru Jump and the Weekly Shōnen Jump Gag Special 2005. Its first edition could be purchased with a Death Note-themed diorama which includes five finger puppets inspired by Near's toys. The five finger puppets are Kira, L, Misa, Mello, and Near. In North America, 13: How to Read was released on February 19, 2008. As of February 2011[update], the manga has been re-released in omnibus format, dubbed "Black Edition". On October 5, 2016, all 12 original manga volumes and the February 2008 one-shot were released in a single All-in-One Edition, consisting of 2,400 pages in a single book. The All-in-One Edition was released in English on September 6, 2017, resulting in the February 2008 one-shot being released in English for the first time. The Death Note anime, directed by Tetsurō Araki and animated by Madhouse, began airing in Japan on October 3, 2006, and finished its run on June 26, 2007, totaling 37 twenty-minute episodes. The series aired on the Nippon Television network "every Tuesday at 23:34". The series was co-produced by Madhouse, Nippon Television, Shueisha, D.N. Dream Partners and VAP. In North America, the series has been licensed by Viz for residents in the United States to use "Download-to-Own" and "Download-to-Rent" services while it was still airing in Japan. This move is seen as "significant because it marks the first time a well known Japanese anime property will be made legally available to domestic audiences for download to own while the title still airs on Japanese television". The downloadable episodes contain the original Japanese audio track and English subtitles, and is available through IGN's Windows-only Direct2Drive service. DVDs of the series have also been released, containing both an English dubbed audio track, produced by Ocean Productions, and the original Japanese audio track with optional English subtitles. Viz announced at Anime Expo 2007 that the first DVD was officially released on November 20, 2007, in both regular and special editions, and also confirmed at Comic-Con International 2007 that the first 15,000 copies of each DVD contains collectible figures. Death Note was slated to make its North American television premiere in Canada, as part of YTV's Bionix block, on September 7, 2007. However, the show was removed from the schedule at the last minute  and the Canadian premiere was pushed back to October 26, 2007, at 10:00 p.m. The series premiered in the U.S. on October 20, 2007, at 11:30 p.m. on Adult Swim and ran until January 10, 2010, when its contract expired. The last episode aired on YTV, July 4, 2008, and would later air on Adult Swim two days later. The show was removed from YTV's schedule on July 5, 2008, with its last airing being a rerun of the final episode at 1:30 a.m. ET. Soon after, Bionix became a 2-hour block on Saturday nights. The show also streamed online free on Adult Swim Video, with a new episode available every Saturday afternoon, on the day of its broadcast premiere. On July 26, 2017, Starz announced that they would be offering episodes of the series for their Video on Demand service starting August 1, 2017. A two-hour animated Death Note Relight: Visions of a God (DEATH NOTE リライト·幻視する神, Desu Nōto Riraito: Genshisuru kami) TV special aired on Nippon Television in Japan on August 31, 2007, at 8:00 p.m. It is a recap which takes place after the series end, where a Shinigami approaches Ryuk in the Shinigami realm in order to learn more about the human world. Instead, Ryuk tells him of all the events leading up to the last story arc, about Light Yagami and his rival L. Originally, this special was advertised as a retelling told from Ryuk's point of view, but it does not give a different point of view from what was originally told. However, it contains updated dialog, as well as a few new scenes. The Japanese broadcaster NTV aired the Death Note: Relight: L's Successors (DEATH NOTE リライト2 Lを継ぐ者, Desu Nōto Riraito 2: L o Tsugu Mono) special on August 22, 2008. Like the first special, this new compilation summarized a part of the 2006–2007 anime television series. Specifically, it recounted the final half of the suspenseful supernatural story, including the investigators Near and Mello's confrontations with the vigilante Kira. This version features more updates than the previous one, most notably omission of the mafia plot. Several soundtracks for the series have been released. The music from the anime was composed by Yoshihisa Hirano and Hideki Taniuchi, while the CDs were also published by VAP. The first one was Death Note Original Soundtrack, which was released in Japan on December 21, 2006. It contains music from the series with the first opening and ending themes are sung by the Japanese band Nightmare in the TV size format. Death Note Original Soundtrack II was first released in Japan on March 21, 2007. It features the new opening and closing themes by Maximum the Hormone in the TV size format. The third CD, Death Note Original Soundtrack III was released on June 27, 2007. The tracks 1-21 were composed and arranged by Taniuchi, while the tracks 22-28 were composed and arranged by Hirano. The album features one track sung by Aya Hirano, who was also the Japanese voice actress of Misa Amane in the anime series. Also appearing on this soundtrack is the ending theme Coda〜Death Note, which can be heard at the end of the final episode of the anime as the credits are shown. Several soundtracks have also been released for the live action films. Sound of Death Note is a soundtrack featuring music from the first Death Note film composed and arranged by Kenji Kawai. It was released on June 17, 2006 by VAP. Sound of Death Note the Last name is the soundtrack from the second Death Note film, Death Note the Last name. It was released on November 2, 2006. Death Note Tribute is a tribute album dedicated to the live action film Death Note. Published by BMG Japan on June 21, 2006 Japan, it contains 15 tracks performed by various artists, such as Shikao Suga, M-Flo, Buck-Tick, and Aya Matsuura. The soundtrack came with a cosplay Death Note notebook. Another tribute album is The Songs for Death Note the movie〜the Last name Tribute dedicated to the second film. Published by Sony Music Entertainment Japan on December 20, 2006, it contains 14 tracks performed by various artists, such as Orange Range, Abingdon Boys School, High and Mighty Color, Doping Panda, and Galneryus. A light novel adaptation of the series has been written by Nisio Isin, called Death Note Another Note: The Los Angeles BB Murder Cases. The novel was released by Shueisha on August 1, 2006. It serves as a prequel to the manga series, with Mello narrating the story of L's first encounter with Naomi Misora during the Los Angeles "BB Serial Murder Case" mentioned in volume 2 of the manga. Beside Naomi's character, the novel focuses on how L works and one of the criminals L has to chase down. Insight was given into Watari's orphanage and how the whole system of geniuses such as L, Mello, Beyond Birthday, Matt and Near were put to work. Viz released the novel in English on February 19, 2008. The film L: Change the World was also adapted into a light novel with the same name on December 25, 2007 by "M", While the novel is similar to the film, there are many significant changes to the plot (for example, Near is not a Thai boy, but the same Near that appears in the manga). It also reveals more information about L and his past. Viz released it on October 20, 2009. 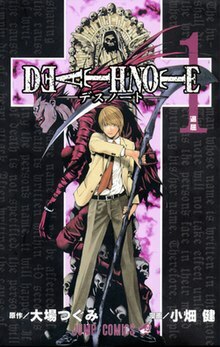 A Death Note video game developed and published by Konami for the Nintendo DS, titled Death Note Kira Game (デスノート キラゲーム, Desu Nōto Kira Gēmu), was released on February 15, 2007. Kira Game is a strategy game where the player takes on the role of Kira or L. These are just titles, as any character can be Kira or L. The player will attempt to deduce who their enemy is (Kira will try to uncover L's identity and vice versa). This will play out in three phases: investigation, where the player will discuss the case and clues with other characters; voting, where each member of the investigation team casts a vote on who they suspect is L or Kira based on the player's performance in the previous phase; L/Kira, where the player can either focus their investigation on one member to see if they are Kira (L part), or force a member off of the team (Kira part). A sequel to the game, Death Note: Successors to L (デスノート Lを継ぐ者, Desu Nōto Eru o Tsugu Mono), was released in Japan on July 12, 2007. The storyline is based on the second part of the manga, featuring characters such as Mello and Near. A third game, L the Prologue to Death Note -Spiraling Trap- (L the proLogue to DEATH NOTE -螺旋の罠-, L the proLogue to DEATH NOTE -Rasen no Wana-), was released for the Nintendo DS in Japan on February 7, 2008. The player assumes the role of a rookie FBI agent who awakens in a strange hotel and attempts to escape with the help of L, who provides assistance via an in-game PDA. The story is set before the Kira investigation in the original series. Several characters from Death Note appear in Jump Super Stars and Jump Ultimate Stars, a fighting game featuring a plethora of characters from Shōnen Jump titles. Light, Ryuk, and L appear in Jump Super Stars as support characters. Misa, Near, and Mello are added as support characters in Jump Ultimate Stars as well. The 2019 video game Jump Force features Light and Ryuk as non-playable characters, playing a key role in the game's story mode. Death Note was adapted into a series of live action films in 2006. The first two films were directed by Shusuke Kaneko and the third was directed by Hideo Nakata and produced by Nippon Television, CG production of all three films were done by Digital Frontier and distributed by Warner Bros. Pictures Japan. The first film, simply titled Death Note, premiered in Japan on June 17, 2006 and topped the Japanese box office for two weeks, pushing The Da Vinci Code into second place. The first film briefly played in certain North American theaters on May 20–21, 2008 The film was broadcast in Canadian theaters for one night only on September 15, 2008. The DVD was released on September 16, 2008, one day after the Canadian showing. The sequel, Death Note 2: The Last Name, premiered in Japan on November 3, 2006. It was featured in U.S. theaters in October 2008. A spin-off from the films named L: Change the World was released in Japan on February 9, 2008. It is focused on the final 23 days of L's life, as he solves one final case involving a bio-terrorist group. Two dubbed versions of the film were shown in the United States on April 29 and 30, 2009. In August 2016, a three-part miniseries entitled Death Note: New Generation was announced as a part of the Death Note live-action film series and aired in September. It bridges the 10-year gap between the previous films and the then-upcoming 2016 film. A fourth Japanese Death Note film was released in 2016 and featured a cyber-terrorism setting with the inclusion of six Death Notes brought into the human world. An American adaptation was released on Netflix on August 25, 2017. The film was directed by Adam Wingard and was written by Charles Parlapanides, Vlas Parlapanides, and Jeremy Slater. It starred Nat Wolff, Lakeith Stanfield, Margaret Qualley, Shea Whigham, Paul Nakauchi, Jason Liles, and Willem Dafoe. In April 2015, it was announced that a live action television series based on Death Note manga would begin airing from July 2015 on NTV. Masataka Kubota stars as Light Yagami and Kento Yamazaki as L in the series. In 2015, a musical adaptation of the manga called Death Note: The Musical ran in both Japan and South Korea. It was originally composed in English by Broadway composer Frank Wildhorn, with lyrics by Jack Murphy and book by Ivan Menchell, though no English-language production has been announced as of September 2017[update]. The original Japanese production, produced by Japanese talent agency HoriPro, ran from April 6, 2015 to April 29, 2015 and stars Kenji Urai and Hayato Kakizawa double-cast as Light Yagami, and Teppei Koike as L. A Korean production of the same musical ran from June 11 to August 11, 2015 in South Korea, starring musical actor Hong Kwang-ho and JYJ member and musical actor Kim Junsu. Death Note has received acclaim from both critics and audiences, with praise aimed at the complex and cerebral storyline, mature themes and plot and character development, especially that of the two main protagonists. As of April 2015[update], Death Note's twelve volumes had over 30 million copies in circulation. The series won the 2008 Eagle Award for Favourite Manga as voted by UK fans. According to a survey conducted in 2007 by the Ministry of culture of Japan, occupies the 10th place among the best manga of all time. It also received several nominations such as Best Manga at the 2006 American Anime Awards, the 2007 Tezuka Osamu Cultural Prize, an Official Selection at Angoulême International Comics Festival 2008, and Obata was nominated for Best Penciller/Inker at the 2008 Eisner Awards. In 2007, the first three volumes of Death Note were on the American Library Association's 2007 Great Graphic Novels for Teens Top Ten list. On ICv2's "Top 10 Shonen Properties Q2 2009", Death Note was the third best manga property from North America. Douglas Wolk of Salon said that a rumor circulated stating that the creators intended to create Death Note to last half as long as its actual run and Ohba and Obata had been persuaded to lengthen the storyline when Death Note's popularity increased, noting that the rumor "makes sense, since about halfway through the series, there's a point that seems like a natural ending". In addition, he said that fans wrote "thousands" of Death Note fan fiction stories and posted them on the internet. In 2006, Japanese fans pointed out the similarities between Death Note and the 1973 one-shot "The Miraculous Notebook" (不思議な手帖) by Shigeru Mizuki. Comipress reported that the only difference between the story and Death Note is that there are no Shinigamis. Anime News Network (ANN) writer Zac Bertschy called Death Note a "surprisingly gripping and original suspense tale that raises a handful of interesting questions about morality". He noted that the difference between the series and other manga from the same demographic was very big due to the murders the main character commits as well as how he hides his identity of Kira. Although Bertschy mentioned some shōnen manga readers will be surprised with the dark themes of Death Note, he praised the series for its "great art, great story, [and] compelling characters". Julie Rosato from Mania Entertainment found the story to be very entertaining, having liked Light's development in the story and L's introduction as well as how the latter starts suspecting the former's identity. Additionally, she praised the story as it is "building a climax" with each detail introduced in the first chapter, making the reader look forward to upcoming chapters. Briana Lawrence from ANN stated that what makes Death Note so interesting is that there is no villain, "instead it had two opposing sides that both believe in the same thing: justice". She felt that while the series' second half was not as good, with Light seeming less intelligent and once vital characters fading into the background, the ending brings back what the fans loved about the first volume and the supporting cast are "given a chance to shine". However, she did not like how the epilogue made no mention of what happens with Misa Amane and how Near and Mello were still treated like parts of L. Jacob Hope Chapman from ANN praised Teru Mikami's role as bloody and flashy as ever better than that of Near, Mello, and Misa. Jolyon Baraka Thomas, in a Japanese Journal of Religious Studies article, describes the manga as having a "somber narrative" with a "dark cast". Obata's art is "[rendered] in stark strokes characterized---fittingly---by a complex interplay of light and shadow". Running over thirty-seven 20 minutes episodes, the anime sticks much closer to the manga so takes a far more languid approach to storytelling, better fleshing out the fantastic characters of Light and his nemesis, L. Light in particular is one of the most layered characters to appear in anime in a long time. A.E. Sparrow of IGN reviewed the novel Another Note and gave it a 9.5 out of 10. Sparrow said that the author understood "what made these characters click so well" and "captures everything that made the manga the compelling read that it is". Sparrow said that fans of Death Note who read Another Note will "find a welcome home" in Nisio Isin's work that "adds a few more fun layers" to the Death Note franchise. The novelization L: Change the World became the second top-selling light novel in Japan during 2008. The series' release outside Japan was met with a wave of copycat crimes. According to Wired magazine, Death Note "[turned] Japan's most-popular print medium into an internationally controversial topic that has parents wondering whether they should prohibit their kids from reading manga entirely". Live-action director Shusuke Kaneko commented in response, "If preventing them from seeing this movie is going to make kids better, then why not prevent them from watching all bad news?". Early in 2005, school officials in Shenyang, the capital of Liaoning (People's Republic of China), banned Death Note. The immediate cause was that students had been altering notebooks to resemble Death Notes and then writing the names of acquaintances, enemies, and teachers in the books. The ban was designed to protect the "physical and mental health" of students from horror material that "misleads innocent children and distorts their mind and spirit". Jonathan Clements has suggested that the Chinese authorities acted partly against "superstition", but also against illegal, pirate publishers of Death Note. The ban has been extended to other Chinese cities including Beijing, Shanghai and Lanzhou in Gansu Province. Legally published Chinese-language versions of Death Note are published in Hong Kong. On June 12, 2015, the Chinese Ministry of Culture listed Death Note among 38 anime and manga titles banned in China. In 2007, the education bureau in Pingtung County, Taiwan asked teachers to heed any negative influence on elementary school students reading the manga. The Albuquerque Public Schools in New Mexico, U.S. held a hearing in May 2010 to ban the Death Note manga from their district's schools; it was unanimously voted down. After volumes of Death Note were found at the February 2013 suicide of a 15-year-old girl in Yekaterinburg, Russia, a local parents' group began campaigning to regulate all media based on the series, saying that it had an adverse effect on the minds of children. In March 2014, investigators concluded that the manga did not cause the girl to commit suicide. There have been various copycat crimes around the world which were based on Death Note. [clarification needed (see talk)] On September 28, 2007, two notes written with Latin characters stating "Watashi wa Kira dess" [sic], a mis-transliteration of "I am Kira" (私はキラです, Watashi wa Kira desu), were found near the partial remains of a Caucasian male in Belgium. The case has been called the "Mangamoord" (Dutch for Manga Murder) in Belgian media. It was not until 2010 that four people were arrested in connection to the murder. A senior at the Franklin Military Academy in Richmond, Virginia, United States was suspended in 2007 after being caught possessing a replica "Death Note" notebook with the names of fellow students. The school's principal wrote a letter to the student's parents linking to an unofficial website where visitors can write names and circumstances of death for people they want to die. In South Carolina in March 2008, school officials seized a "Death Note" notebook from a Hartsville Middle School student. District officials linked the notebook to the anime/manga. The notebook listed seven students' names. The school planned a disciplinary hearing and contacted the seven students' parents. In Gadsden, Alabama in April 2008, two sixth-grade boys were arrested for possession of a "Death Note" that listed names of several staff members and fellow students. According to Etowah County Sheriff's Department Sgt. Lanny Handy, the notebook was discovered the previous afternoon by a staffer. The students were suspended from the county's schools, pending a juvenile court hearing. The students, their parents, and school officials had met with Handy and a junior probation officer. In Gig Harbor, Washington, one middle school student was expelled and three were suspended on May 14, 2008 for having 50 names in their own "Death Note" book, including President George W. Bush. It was reported in September 2009, that a Year Eight boy in Sydney, Australia, created a "Death Note" that along with names contained a "battle plan" detailing where bombs could be placed inside his school. In December 2009, two students at an elementary school in Oklahoma were disciplined for a "Death Note" with the names and descriptions of deaths of two girls that had angered them. A Michigan middle school student was suspended indefinitely in March 2010 for a "Death Note". In May 2010, a middle school student in Avonworth School District in Pennsylvania was suspended for a "Death Note" with names of fellow students and pop singer Justin Bieber. In February 2015, a fifth-grade student of an elementary school near Pittsburgh was suspended for owning a "Death Note" and writing other students' names in it. ^ "The Official Website for Death Note". Viz Media. Archived from the original on 2017-10-27. Retrieved October 27, 2017. ^ "VIZ: Read Death Note, Chapter 1 Manga - Official Shonen Jump From Japan". www.viz.com. Retrieved 2019-02-20. ^ a b Ohba, Tsugumi (2008). Death Note 13: How to Read. Viz Media. p. 59. ISBN 1-4215-1888-0. ^ a b c d Ohba, Tsugumi (2008). Death Note 13: How to Read. Viz Media. p. 173. ISBN 1-4215-1888-0. ^ a b c Ohba, Tsugumi (2008). Death Note 13: How to Read. Viz Media. p. 58. ISBN 1-4215-1888-0. ^ a b Ohba, Tsugumi (2008). Death Note 13: How to Read. Viz Media. p. 180. ISBN 1-4215-1888-0. ^ a b Ohba, Tsugumi (2008). Death Note 13: How to Read. Viz Media. p. 192. ISBN 1-4215-1888-0. ^ Ohba, Tsugumi (2008). Death Note 13: How to Read. Viz Media. pp. 60–61. ISBN 1-4215-1888-0. ^ Ohba, Tsugumi (2008). Death Note 13: How to Read. Viz Media. p. 194. ISBN 1-4215-1888-0. ^ a b "Death Note Manga Spawns Movie, Crime Wave". Wired. 19 May 2008. Archived from the original on August 9, 2013. Retrieved August 24, 2013. ^ Ohba, Tsugumi; Obata, Takeshi (2008). Death Note 13: How to Read. Viz Media. p. 149. ISBN 1-4215-1888-0. ^ Ohba, Tsugumi (2008). Death Note 13: How to Read. Viz Media. p. 69. ISBN 1-4215-1888-0. ^ a b Thomas, Jolyon Baraka. "Horrific "Cults" and Comic Religion". Japanese Journal of Religious Studies. 39 (1): 127–151. ^ a b c d Ohba, Tsugumi (2008). Death Note 13: How to Read. Viz Media. p. 215. ISBN 1-4215-1888-0. ^ a b Kimlinger, Carl (November 2007). "Passion and dreams". Newtype USA. 6 (11): 50–51. ^ "2004年Vol.1" (in Japanese). Shueisha. Archived from the original on February 23, 2013. Retrieved July 14, 2018. ^ "Death Note Licensed by Viz". Anime News Network. April 20, 2005. Archived from the original on 2005-05-27. Retrieved November 19, 2006. ^ "Death Note, Vol. 1". Viz Media. Archived from the original on 2018-12-17. Retrieved December 16, 2018. ^ "Death Note Manga to Return with One-Shot Story in Japan". Anime News Network. February 3, 2008. Archived from the original on 2009-06-11. Retrieved June 7, 2009. ^ Ohba, Tsugumi (2008). Death Note 13: How to Read. Viz Media. pp. 215–223. ISBN 1-4215-1888-0. ^ "Death Note 13: How to Read" (in Japanese). Shueisha. Archived from the original on 2010-12-05. Retrieved June 13, 2008. ^ "Death Note 13: How to Read". Viz Media. Archived from the original on December 26, 2007. Retrieved June 13, 2008. ^ Stimson, Eric (October 2, 2016). "All 2,400 Pages of Death Note Manga Compiled in One Really Big Volume". Anime News Network. Archived from the original on 2017-09-25. Retrieved September 25, 2017. ^ "Viz Media Announces Release of the Definitive Death Note All-in-one Edition" (Press release). Viz Media. September 7, 2017. Archived from the original on 2017-09-26. Retrieved September 25, 2017. ^ "Nippon Television Network Program Catalogue: Animation" (PDF). Nippon Television. p. 17. Archived from the original (PDF) on November 6, 2006. Retrieved November 12, 2014. ^ "Official Death Note Anime Website" (in Japanese). Nippon Television. Archived from the original on 2006-11-09. Retrieved November 6, 2006. ^ "Official Death Note staff listing" (in Japanese). Nippon Television. Archived from the original on 2007-03-21. Retrieved March 28, 2007. ^ "Viz Media Secures Landmark Agreement To Make Death Note Anime Series Available For Download". Mania Entertainment. January 10, 2007. Archived from the original on December 5, 2008. Retrieved January 11, 2007. ^ a b "Death Note Release Won't be Limited to Downloads". Anime News Network. January 13, 2007. Archived from the original on 2007-01-15. Retrieved January 13, 2007. ^ "Viz to Offer Death Note Downloads via Direct2Drive". Anime News Network. May 3, 2007. Archived from the original on 2007-05-09. Retrieved May 4, 2007. ^ Dong, Bamboo (February 24, 2007). "New York ComicCon 2007 – Viz Media – Anime". Anime News Network. Archived from the original on 2007-02-27. Retrieved February 24, 2007. ^ "Viz Media Announces Fall DVD Release of Death Note Anime Series". Anime News Network. June 29, 2007. Archived from the original on 2007-07-01. Retrieved July 2, 2007. ^ Santos, Carlo (July 26, 2007). "Viz Media – Comic-Con International 2007". Anime News Network. Archived from the original on 2007-08-24. Retrieved July 27, 2007. ^ "YTV, Discovery Kids and Treehouse Ring in September with Exciting New Series and Returning Favourites" (Press release). Corus Entertainment. July 23, 2007. Archived from the original on April 11, 2008. Retrieved July 10, 2008. ^ "Death Note Removed from Canada's YTV Schedule". Anime News Network. September 4, 2007. Archived from the original on 2007-10-16. Retrieved September 6, 2007. ^ "Death Note Confirmed to Air on Adult Swim October 20". Anime News Network. September 20, 2007. Archived from the original on 2008-01-23. Retrieved January 16, 2008. ^ "Adult Swim Loses Blood+ & Death Note, Hints at 3 New Anime". Anime News Network. January 11, 2010. Archived from the original on 2010-01-23. Retrieved January 21, 2010. ^ "Press room – Press kids". Corus Entertainment – Press_Corporate. Archived from the original on March 12, 2008. Retrieved June 7, 2009. ^ "Death Note's English Dub Premieres on Web, Television". Anime News Network. October 19, 2007. Archived from the original on 2009-09-29. Retrieved June 7, 2009. ^ "Starz app August 2017 Movies and TV Titles Announced". ComingSoon.net. July 26, 2017. Archived from the original on 2018-07-18. Retrieved July 18, 2018. ^ "Death Note TV Special to be Three-Hour Director's Cut". Anime News Network. July 12, 2007. Archived from the original on 2007-07-14. Retrieved July 13, 2007. ^ "Second Death Note Special to Air on August 22 in Japan". Anime News Network. July 25, 2008. Archived from the original on 2009-06-11. Retrieved June 7, 2009. ^ "Death Note オリジナル・サウンドトラック" (in Japanese). Amazon.com. Archived from the original on 2016-04-09. Retrieved June 13, 2009. ^ "Death Note オリジナル・サウンドトラックII" (in Japanese). Amazon.com. Archived from the original on 2015-12-03. Retrieved June 6, 2009. ^ "Death Note オリジナル・サウンドトラックIII" (in Japanese). Amazon.com. Archived from the original on 2016-04-09. Retrieved June 13, 2009. ^ "Sound of Death Note" (in Japanese). Amazon.com. Archived from the original on 2016-04-09. Retrieved June 13, 2009. ^ "Sound of Death Note the Last Name" (in Japanese). Amazon.com. Archived from the original on 2016-04-09. Retrieved June 6, 2009. ^ "Death Note Tribute" (in Japanese). Amazon.com. Archived from the original on 2016-04-09. Retrieved June 13, 2009. ^ "The Songs for Death Note the movie〜the Last name Tribute" (in Japanese). Amazon.com. Archived from the original on 2016-04-09. Retrieved June 13, 2009. ^ "Death Note, XXXHOLiC Novels in the Works". Anime News Network. May 9, 2006. Archived from the original on 2006-11-13. Retrieved December 7, 2006. ^ "西尾維新 × Death Note" (in Japanese). Shueisha. Archived from the original on December 5, 2006. Retrieved December 21, 2006. ^ "L change the world" (in Japanese). Shūeisha. Archived from the original on December 23, 2008. Retrieved September 4, 2009. ^ "L change the world". Amazon.com. Archived from the original on 2016-04-09. Retrieved October 31, 2009. ^ "Death Note: Kira Game for DS". GameSpot. Archived from the original on October 29, 2007. Retrieved December 17, 2007. ^ a b c "Official Konami Website for Death Note" (in Japanese). Konami. Archived from the original on 2007-02-02. Retrieved February 3, 2007. ^ a b "Promo Video for Death Note's L Prequel Game Streamed (Updated)". Anime News Network. December 17, 2007. Archived from the original on 2007-12-19. Retrieved December 17, 2007. ^ "Death Note - キャラクター紹介" (in Japanese). Nintendo. Archived from the original on 2014-08-17. Retrieved March 15, 2014. ^ "Jump Ultimate Star – Death Note" (in Japanese). Nintendo. Archived from the original on 2013-07-05. Retrieved March 15, 2014. ^ "E3 2018: Jump Force's Death Note Characters Aren't Playable, But Involved For Story". Gamespot. June 14, 2018. Archived from the original on 2018-06-18. Retrieved June 17, 2018. ^ "Death Note Tops Box Office Again". Anime News Network. June 27, 2006. Archived from the original on 2006-12-31. Retrieved December 18, 2006. ^ "1st Death Note Film to Run in 300+ U.S. Theaters in May". Anime News Network. April 14, 2008. Archived from the original on 2008-04-15. Retrieved April 17, 2008. ^ "Death Note Live-Action!! Trailer". Viz Media. April 14, 2007. Archived from the original on April 20, 2008. Retrieved April 17, 2007. ^ "Death Note 2 Trailer". Anime News Network. September 28, 2006. Archived from the original on 2009-08-14. Retrieved June 27, 2009. ^ "2nd Death Note Film to Run in U.S. Theaters in October". Anime News Network. August 25, 2008. Archived from the original on 2009-05-02. Retrieved June 27, 2009. ^ "Death Note's L Spinoff to Open on February 9 in Japan". Anime News Network. July 30, 2007. Archived from the original on 2009-03-18. Retrieved June 27, 2009. ^ "Death Note's L Spinoff Film in U.S. Theaters in April". Anime News Network. March 6, 2009. Archived from the original on 2009-06-09. Retrieved June 27, 2009. ^ Tweet announcing the new series, Death Note film's official twitter @DeathNote_2016, 2016 August 9. ^ huluオリジナルドラマ配信決定！ 映画へと続く衝撃作！ Archived 2016-08-17 at the Wayback Machine, Death Note film's official news release, 2016 August 9. ^ 2016 Death Note Film Gets 3-Episode Prequel on Hulu Japan Archived 2016-08-13 at the Wayback Machine, Anime News Network, 2016 August 9. ^ "Live-Action Death Note Films Get 2016 Sequel by Gantz Helmer Sato". Archived from the original on 2015-09-14. Retrieved September 13, 2015. ^ "New Live-Action Death Note Film Stars Sōsuke Ikematsu, Masahiro Higashide, Masaki Suda". Anime News Network. Archived from the original on 2016-03-05. Retrieved 2016-02-25. ^ Opam, Kwame (March 22, 2017). "Watch the first trailer for Netflix's live-action Death Note movie". The Verge. Vox Media. Archived from the original on 2017-05-18. Retrieved August 27, 2017. ^ "Character Visuals for "Death Note" TV Drama Adaptation Revealed". Crunchyroll. May 25, 2015. Archived from the original on 2015-05-28. Retrieved June 17, 2015. ^ "Frank Wildhorn Musical Death Note Has NYC Reading With Andy Kelso, Robert Cuccioli and Adrienne Warren Prior to Japanese Premiere". Playbill. April 17, 2014. Archived from the original on 2015-08-18. Retrieved April 16, 2015. ^ "Death Note: The Musical Official English Website". HoriPro Inc. April 1, 2015. Archived from the original on April 17, 2015. Retrieved April 16, 2015. ^ "JYJ's Junsu Cast in Musical Adaptation of "Death Note"". Soompi. April 5, 2015. Archived from the original on 2015-04-09. Retrieved April 6, 2015. ^ "′Death Note′ The Musical Unveils JYJ′s Kim Junsu and More in Korean Cast". Mwave. April 6, 2015. Archived from the original on 2015-04-09. Retrieved April 6, 2015. ^ "UK Fans Give Eagle Award to Death Note Manga". Anime News Network. May 14, 2008. Archived from the original on 2014-08-08. Retrieved August 4, 2014. ^ "The Top 50 Manga Series". Japan Probe. Archived from the original on 2012-07-02. ^ "Finalists for the American Anime Awards". ICv2. February 8, 2007. Archived from the original on 2009-07-07. Retrieved May 30, 2009. ^ "American Anime Award Winners". ICv2. February 26, 2007. Archived from the original on 2012-01-27. Retrieved February 13, 2008. ^ "11th Annual Tezuka Cultural Prize Winners Announced". Anime News Network. December 27, 2007. Archived from the original on 2015-07-25. Retrieved August 4, 2014. ^ "Manga Nominated for Awards at Angouleme Festival". Anime News Network. January 22, 2008. Archived from the original on 2014-07-03. Retrieved August 4, 2014. ^ "Manga Listed Among Eisner Award Nominees for 2008". Anime News Network. April 14, 2008. Archived from the original on 2014-08-23. Retrieved August 4, 2014. ^ "2007 Great Graphic Novels for Teens Top Ten". American Library Association. Archived from the original on April 15, 2009. Retrieved June 28, 2009. ^ "'ICv2 Insider's Guide' #67: Top 10 Shonen". ICv2. July 30, 2009. Archived from the original on 2009-08-03. Retrieved August 19, 2009. ^ Wolk, Douglas (July 26, 2007). "Death strip". Salon. Archived from the original on 2015-09-24. Retrieved August 10, 2015. ^ "The Origin of Death Note?". Comipress.com. January 8, 2007. Archived from the original on 2011-06-05. Retrieved August 4, 2014. ^ Bertschy, Zac (September 29, 2005). "Death Note GN 1". Anime News Network. Archived from the original on 2009-06-07. Retrieved June 8, 2009. ^ Rosato, Julie (November 3, 2005). "Death Note Vol. #02". Mania Entertainment. Archived from the original on November 30, 2012. Retrieved June 8, 2009. ^ Lawrence, Briana (August 5, 2007). "Death Note GN 12". Anime News Network. Archived from the original on 2014-07-05. Retrieved June 8, 2009. ^ Chapman, Jacob Hope (January 30, 2010). "Death Note Relight 2". Anime News Network. Archived from the original on 2014-07-05. Retrieved November 29, 2014. ^ "Results of 6th Annual Tokyo Anime Awards Announced". Anime News Network. March 19, 2007. Archived from the original on 2016-04-30. Retrieved June 7, 2016. ^ Pepirium, Tom S. (November 19, 2007). "Death Note: "Tactics" Review". IGN. Archived from the original on 2007-11-21. Retrieved June 15, 2008. ^ Pepirium, Tom S. (February 27, 2008). "Death Note: "Ally" Review". IGN. Archived from the original on 2008-03-02. Retrieved June 15, 2008. ^ Powers, John (April 28, 2008). "Killer Penmanship in 'Death Note'". NPR. Archived from the original on 2008-05-26. Retrieved June 15, 2008. ^ "51. Death Note". IGN. January 23, 2009. Archived from the original on March 16, 2010. Retrieved September 5, 2009. ^ "Death Note: Volume 1". Hyper. Next Media (173): 79. March 2008. ISSN 1320-7458. ^ Sparrow, A.E. (April 8, 2008). "Death Note – Another Note: The Los Angeles BB Murder Cases Review". IGN. Archived from the original on 2011-02-11. Retrieved June 15, 2008. ^ "2008's Top-Selling Light Novels in Japan (Updated)". Anime News Network. January 4, 2009. Archived from the original on 2009-09-29. Retrieved August 19, 2009. ^ "Chinese city bans Death Note" (in Chinese). Xihuanet. January 11, 2005. Archived from the original on 2008-12-25. Retrieved September 4, 2008. ^ "Death Note Stirs Controversy in China". Anime News Network. February 6, 2005. Archived from the original on 2008-09-15. Retrieved August 27, 2008. ^ "Death Note in China – Success or Disaster?". ComiPress. March 26, 2007. Archived from the original on 2010-11-21. Retrieved August 27, 2008. ^ "Beijing bans scary stories to protect young". Reuters. May 15, 2007. Archived from the original on 2007-05-17. Retrieved May 15, 2007. ^ Weifeng, Liu (May 26, 2007). "'Death Note' days numbered". China Daily. Archived from the original on 2007-05-28. Retrieved May 27, 2007. ^ a b Clements, Jonathan (August 2007). "Manga Pulse" (35). NEO Magazine: 19. ^ Jie, Xiao (May 15, 2007). "Beijing publisher to ignore Beijing's ban of its horror story". Xinhuanet. Archived from the original on 2008-07-07. Retrieved August 27, 2008. ^ "Chinese Students Fight Back at Death Note Ban". ComiPress. June 5, 2007. Archived from the original on 2010-12-14. Retrieved June 15, 2008. ^ "Officials ask teachers to monitor 'Death Note' fans". Taipei Times. Archived from the original on 2018-10-29. ^ a b "Death Note Ban in Albuquerque High Schools Fails Vote". Anime News Network. May 10, 2010. Archived from the original on 2014-08-08. Retrieved August 4, 2014. ^ "Parents in Russia request ban on 'Death Note'". Japan Today. April 29, 2013. Archived from the original on 2014-08-10. Retrieved August 4, 2014. ^ ГОРБУНОВ, Андрей (2014-03-04). "Следователи решили, что "Тетради смерти" не доводили уральскую школьницу до самоубийства". Комсомольская правда. Archived from the original on 2016-09-18. Retrieved 2016-09-20. ^ "Forest: le tueur aux mangas". La Dernière Heure. October 1, 2007. Archived from the original on 2010-01-06. Retrieved January 4, 2010. ^ "Police Reaches Dead End in Belgian 'Manga Murder' Case". Anime News Network. 2007-11-27. Archived from the original on 2014-08-08. Retrieved 2014-08-04. ^ "4 Arrested for 2007 Belgian 'Manga Murder' Case". Anime News Network. September 20, 2010. Archived from the original on 2015-02-02. Retrieved August 4, 2014. ^ "Virginian Teen Suspended over Names in 'Death Note'". Anime News Network. November 22, 2007. Archived from the original on 2008-06-07. Retrieved May 24, 2008. 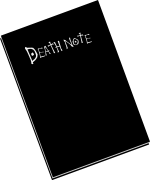 ^ "South Carolina Student Removed over "Death Note" List". Anime News Network. March 2, 2008. Archived from the original on 2008-06-08. Retrieved May 24, 2008. ^ "2 Alabama 6th-Grade Boys Arrested for Death Note Book". Anime News Network. April 4, 2008. Archived from the original on 2008-05-16. Retrieved May 24, 2008. ^ "4 Washington Middle Schoolers Disciplined over "Death Note"". Anime News Network. May 24, 2008. Archived from the original on 2008-05-26. Retrieved May 24, 2008. ^ "Dark clouds of mental illness trouble young children". The Daily Telegraph. September 29, 2009. Archived from the original on 2016-09-28. Retrieved 2014-08-04. ^ "Thief rips front door off station". Oklahoma City Friday. December 2009. Archived from the original on 2014-08-08. Retrieved August 4, 2014. ^ "Michigan Middle School Boy Suspended Over 'Death Note'". Anime News Network. March 26, 2010. Archived from the original on 2014-08-08. Retrieved August 4, 2014. ^ "Police Investigate Pennsylvania Boy Over 'Death Note'". animenewsnetwork.com. AnimeNewsNetwork. Archived from the original on 2015-02-19. Retrieved February 28, 2015.